The Administration and Operations Division, under the supervision of Gene Cotter, Deputy Administrator, is responsible for maintenance and enforcement of the Policies and Procedures, Information Technology and its use to improve communication, programs, and procedures throughout the state, Personnel, and the development and implementation of the Nebraska Probation Applications Community Safety (NPACS) case management system. In addition, Administration and Operations Division is responsible for procurement and maintenance of all state-owned equipment used by Probation Administration staff. Information Technology. Probation Information Technology supports the vision and mission of the Nebraska Probation System through innovative technology solutions. 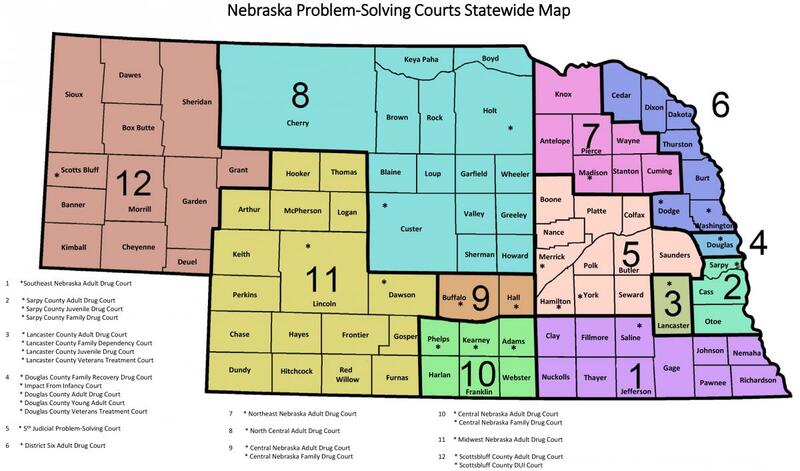 The Nebraska Probation Application for Community Safety (NPACS) is a solution that provides online case management for the fourteen Probation Districts throughout the state. Other solutions that support the effective and efficient operation of the Probation system include applications to manage vouchers, register service providers and deliver online training. Travel time and expense is reduced by using video conferencing, and communication is enhanced by sharing information via an intranet. Probation Information Technology seeks to continually improve its processes and services to enable the Probation system to serve the public and ultimately, to fulfill Probation’s vision for excellence in justice and community safety. Personnel. Personnel oversees human resource functions, advises employees and management on personnel policies and procedures, oversees the disciplinary process and employee relations issues, monitors staffing and employment actions, coordinates employee benefits, and processes payroll. Policies and Procedures. Uniform policies and procedures expressing system philosophies, goals, and operational procedures are developed, maintained, and approved by the Supreme Court. Policies and procedures are made accessible to all employees. Policies and procedures are monitored regularly and revised as necessary to ensure compliance with System program goals. State-Owned Inventory. Administration and Operations is in charge of handling state-wide inventory, which includes communication and officer safety devices, video-conferencing equipment, as well as training equipment. It is essential to make the most of our resources, while maintaining cost effectiveness. By monitoring and having the right equipment available for the right purpose at the right time, state-wide inventory meets the needs of the probation staff while insuring that the equipment meets the needs of the officers as well as community safety. Gene Cotter was appointed Deputy Administrator for Personnel, Operations and Information Technology effective September 1, 2016. He previously served as the Assistant Deputy Administrator for Programs and Services. He began his Probation career in August 1990. During his 26-year career with Probation, Gene has held a variety of supervisory and adult and juvenile officer positions in multiple districts statewide, including Chief Probation Officer of District #3A in Lincoln, Specialized Substance Abuse Supervision, Intensive Supervision Probation and Investigations. Gene has been instrumental in the implementation of the statewide rollout of the Justice Reinvestment Initiative. Gene is currently serving on several committees and working groups including the Justice Behavioral Health Committee, the Programs and Field Services Committee and the Executive Policy Committee. He was certified as a Probation trainer in 1992, and has continued training a variety of courses since that time. Gene has been a member of the American Probation and Parole Association (APPA) for many years and graduated from the APPA Leadership Institute in August of 2014, where he also received the Norm Leslie Helber Scholarship, recognizing him as the Outstanding Graduate of the 2014 Leadership Institute. Gene is one of APPA’s elected Regional Representatives and served as the National Program Chair for APPA’s 2016 Winter Training Institute in Atlanta, Georgia. In April of 2013, Gene was awarded the Probation Management Above and Beyond exemplary leadership award. Gene holds a Bachelor of Science degree in Criminal Justice with a Minor in Psychology from the University of Nebraska/Lincoln. Jacey Rader was appointed as Assistant Deputy Administrator of the Administration & Operations Division in May of 2018. Jacey serves as the Commissioner for the Interstate Compact for Adult Offender Supervision (ICAOS) and the Interstate Commission for Juveniles in the State of Nebraska. Jacey graduated from the University of Nebraska at Lincoln in 2002 and has a bachelor’s degree in Criminal Justice. She began her career with probation in 2004, and served as a probation officer until 2013, when she was promoted to Compliance Officer with the Administrative Office of Probation. In 2014, she was appointed to the Deputy Compact Administrator position and currently serves as the Commissioner for the Interstate Commission for Adult Offender Supervision (ICAOS). Jacey serves on the Probation Training and Programs and Services Committees, and chairs the National ICJ Compliance Committee. She is a national trainer for interstate compact matters and serves on numerous special committees. In Nebraska, Jacey spearheaded the implementation of custodial sanctions on interstate compact transfer offenders and worked to implement a process to ensure interstate compact cases are entered into the statewide JUSTICE system. In addition to her work with the Compact Office, Jacey oversees the Compliance Office with the Administrative Office of Probation and the statewide District Evaluation process. Jacey also works to ensure Probation’s Policies and Procedures are regularly revised and published and she works with the Information Technology and Data Analyst teams. In 2016, Jacey served as the Interim Chief Probation Officer of District 1. Jacey is a member of the Advanced Coaching 4 Excellence (ACE) Team and is committed to advancing and supporting the implementation of evidenced based case management strategies. Jacey is a member of the American Probation and Parole Association (APPA) and the National Association of Probation Executives (NAPE). Jacey was awarded Probation’s Rising Star Award in 2014.